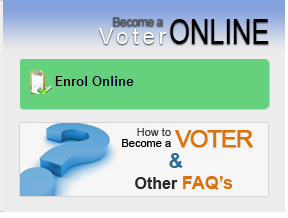 Click on "Enrol Online" link on right-top side of the website. Now login with your username/password and click on "Form 6" link. Now Select your Assembly Constituency and fill all your details. Click on Continue and upload scanned copy of your photograph and Address Proof. After 2-3 week a Electoral Officer will visit to you address and verify the same. If verification is OK then you will get the Voter Id Card after few weeks. Note:- Remember your "Application ID" to track the status of the same.